Large: 14"-16" X-Large: 16"-18" Small: 10"-12" Medium: 12"-14"
The X-back Knee Brace helps relieve knee pain due to joint injury or muscle weakness, by providing gentle support and compression over the knee. 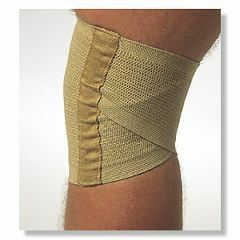 It is constructed of an 8" knitted elastic with a anti-roll criss-cross design and lateral stays for added support. *Measure knee circumference for sizing.